I'm always looking for a way to make food that is fun and interesting for my kids. Sometimes it's about making things in fun shapes, other times it's about presentation, and other times it has to do with color. Popsicles are fun, but they had lost their novelty for us, so I came up with this version. You can make as many layers as you want in as many colors as you want. 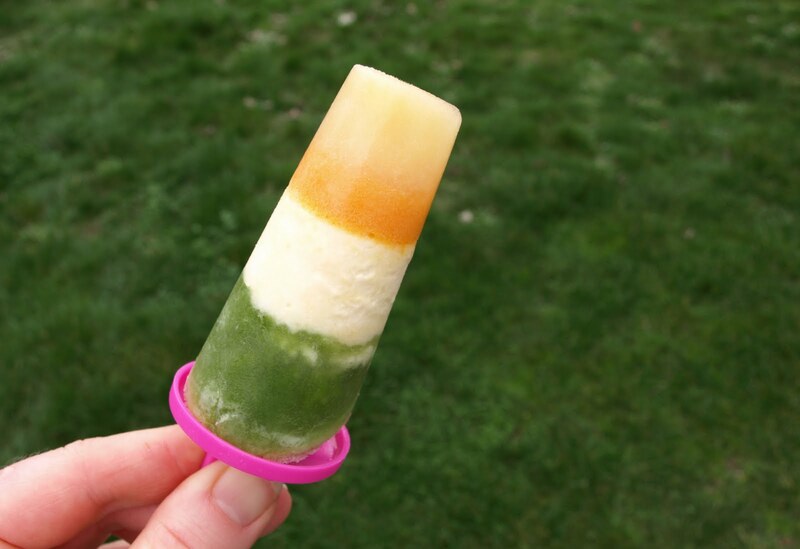 Layers can be either fruit/veggie juice, like popsicles, or can be ice cream. You can use coconut ice cream, peach ice cream (which can be made with other fruit such as pear or mango), or kefir cream ice cream. If you want to sweeten the layers, heat the juice just enough to dissolve some honey in it (to taste). If you put a layer of vanilla ice cream between two orange layers, it's like a creamsicle. To make the popsicles, pour a layer of juice into the bottom of each mold and let it freeze. Once the bottom layer is frozen (or nearly frozen), then pour another layer of juice or spoon a layer of ice cream in. Continue this process until you have created all of your layers. Inserting the stick or handle can be a bit tricky since you can't stick it into an already frozen layer. The molds that I have have a handle with a small stick, so it just got frozen into the last layer. If you do it this way, you have to be very careful when removing the popsicles from the molds or they can come apart at the layers. It would work better to put long sticks in that go through each layer, and have some way of holding them up, such as covering the molds with plastic wrap or foil that will hold the sticks in place.